In this Angular 7 tutorial course we'll learn to build a complete web application from scratch. This tutorial is part of an ongoing series for teaching Angular for beginner developers. Before diving into practical steps for developing an Angular 7 web application. Let’s first learn about the basics of this front-end framework and how to get started using it. You can also learn how we consume a Django RESTful API from an Angular interface in this tutorial which used v6. Throughout this beginner's series, you'll learn how you can use v7 to build client side web applications for mobile and desktop. v7, was just released and has many new features under the hood particularly regarding the Angular CLI 7 tool-chain. One amazing feature you'll love is the CLI Prompts which allows you to interactively choose the libraries you want to include in your project such as routing. In this tutorial series we'll also learn how to upgrade our previously built project from v6 to v7. How to use the Angular CLI 7 for quickly creating a front-end project, generating components, pipes, directives and services. use Bootstrap 4 for building professional-grade UIs. Frameworks provide abstractions for working with many aspects like for example DOM manipulation and Ajax/HTTP. if the technology deals with only one aspect, it's mostly called a library. For example popular libraries like React or Vue.js deal only with the view or the UI of an application by using a virtual DOM and diffing with the real DOM which provides better performance. Among the powerful concepts that were introduced by AngularJS, is the concept of data binding which enables the view to get automatically updated whenever the data (the model layer) is changed and inversely. The concept of directives was also introduced by AngularJS, which allows developers to create their own custom HTML tags. The other introduced concept is Dependency Injection, which allows developers to inject what's called services (singletons that encapsulates a unique and re-usable functionality within an application) into other components which encourages re-usability of the code. In this section we'll see a subset of the features of v7, you can refer to this article for more features. Angular 7 introduced a new needed feature that enables the CLI to interactively running commands like ng new or ng add. For example, of you want to create a project using the ng new command , the CLI will ask you if you would like to add routing. If your answer is Yes, It will install the required dependencies and setup a routing module and import it into the main module automatically and add a router outlet in the main component. anything except. The CLI will also ask you of the format you want to use for stylesheets and give you options (CSS, Sass, SCSS etc.) to choose from. CLI Prompts can be also customized using the angular.json file. No just that,they can be also used with Angular Schematics to enable developers to prompt users when installing their libraries which can be done by using the x-prompt key inside a Schematics collection. With Angular 7, new projects are defaulted to use Budgets in the CLI which will notify developers when the initial bundle has more than 2MB in size and will throw an error when it has 5MB in size. These limits can be easily changed from the angular.json file. Virtual scrolling is a strategy mostly used in mobile UI libraries which allows developers to maintain performance while scrolling a large set of items. Now the Angular 7 Material CDK has added support for virtual scrolling. You need to simply use the <cdk-virtual-scroll-viewport> component to work with large lists of items. This works by simply rendering the only items that actually fit on the visible part of the app's UI. You can read more information from Angular Material docs. With Angular 7, you can use drag and drop without resorting rto any external libraries for that matter as the support is built right into the CDK. You can read more about drag and drop. Angular 6 brought a set of new features and additions. The most work that was done in this version was about the tool-chain and the CLI. You can also add new libraries by using Angular 6 Schematics to create schematics for new libraries. Using ng update, It's easy than before to update your Angular 4|5 projects to use Angular 6. And you can also use Schematics to make it easy to integrate third-party libraries with ng update. With Angular 6, the configuration file for the CLI .angular-cli.json is renamed to angular.json. The overall strcuture of angular.json has also changed. The Angular CLI 6 now generates a work-space which includes multiple apps, among them one default app. So you can have multiple apps per one project and you can also add libraries as a part of the project (ng g library my-lib). Schematics is a powerful workflow tool for Angular. It can be used to apply transforms to your project, such as creating new components, updating old code automatically etc. This will allow you to build frameworks on top of your project which can boost your productivity like never before. The Angular team has done a re-write of the Angular renderer. It's code named Ivy. This new renderer will allow you to produce smaller bundles in size like Preact for example. Ivy has experimental support in Angular 6 and can be enabled with a configuration option. Angular 6 depends on TypeScript 2.7. Angular 6 has support for RxJS 6. RxJS brings new changes and features such as new import paths, tree-shakablility resulting in even smaller Angular bundles etc. Angular 5, code named pentagonal-donut, was just released. It has new features and internal changes which make Angular applications faster and smaller. In this section we will go over the most important changes and instructions on how to upgrade your existing Angular 2+ project to latest version. As of Angular 5.0.0, the build optimizer is enabled by default which applies a series of optimizations to builds. The Angular team has also improved the compiler which can make now faster rebuilds (especially for production and AOT builds) thanks to incremental compilation. The Angular team has added many features to Angular decorators. Developers can now ship faster and smaller bundles by removing white spaces. The Angular compiler now supports TypeScript 2.3 Transforms a new feature that enables you to hook into the standard TypeScript compilation pipeline. Make sure to use the --aot switch to enable this feature. You can now get rid of white spaces in template's code by setting preserveWhitespaces to false in the component's decorator. You can also turn it on globally by setting "preserveWhitespaces":falseunderangularCompilerOptions in tsconfig.json. This will help reduce your app's final bundle size. You can now use lambdas inside Angular component's decorator. New improved number, date, and currency pipes that have better standardization support across browsers without i18n polyfills. Size and performance: Angular 4 applications are smaller by hundreds of kilobytes, thanks to the improvements to the View Engine which have reduced the size of generated components code by around 60% . The Animations are no longer part of Angular core which means that the apps which don't use them don't need to include the extra code in their final bundles. You can use animations in your apps by using BrowserAnimationsModule which can be imported from @angular/platform-browser/animations. If the ready variable is false Angular will show the loading template. to use server side rendering for Angular apps. It's available from @angular/platform-server. One of the reasons jQuery was popular is the difficulty to manipulate the DOM in the browser. jQuery came with an easy to use API to can be used across all the popular browsers without worrying about your website not working on some browser. Modern frameworks like Angular, React or Vue.js share a common general philosophy which is abstracting all direct operations with the DOM and using a component-based architecture. jQuery is primarly a DOM manipulation library; Angular is a complete platform for creating client side mobile and web apps. jQuery is mostly used to add interactivity to web pages; Angular is used to create full-fledged SPAs with advanced features such as routing. jQuery does not offer advanced patterns like components, directives, pipes and two-way binding; Angular is all about a component-based architecture with features like routing, dependency injection etc. jQuery can become very difficult to maintain when the project grows but in the case of Angular, different tools, such as feature modules, are introduced to make working with large project easier. Angular is an open-source and TypeScript-based platform for building client-side web applications as Single Page Applications. Angular provides features such as declarative templates, dependency injection and best patterns to solve everyday development problems. It provides support for most platform and web browsers such as web, mobile, and desktop. It convenient and can be used with Electron to develop native desktop apps etc. Angular provides you with the tools and also with powerful software design patterns to easily manage your project. It's batteries-included which means you don't have to look for a separate tool for different tasks. With Angular, you have built-in libraries for routing, forms and HTTP calls etc. You have templates with powerful directives and pipes. You can use the forms APIs to easily create, manipulate and validate forms. Angular uses RxJS which is powerful reactive library for working with Observables. Angular is a component-based framework which means decoupled and re-usable components are the basic building of your application. In Angular DOM manipulation is abstracted with a set of powerful APIs. Angular is a powerful framework that can be also used to build PWAs (Progressive Web Apps). Now let's see how we can start using the latest Angular 7 version. Prior working experience or understanding of HTML and CSS. In case you have started a project with Angular v6, you can update it to Angular 7 instead of creating a new one from scratch. This can be done in a few steps. 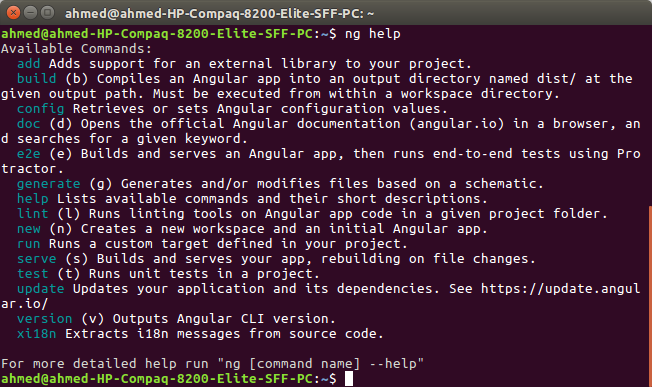 Please refer to this tutorial on how to update existing Angular CLI projects for the full list of instructions. In fact thanks to the amazing work done in v6 it's now more easier than ever to upgrade to the latest version. You can clone a quick-start Angular project from GitHub to generate a new project. In this tutorial, we’ll use the Angular CLI v7 to generate our Angular 7 front-end project. It’s also the recommended way by the Angular team. - Upgrading from an existing Angular 6 project or any previous version (refer to sections on top for more information). The best way though is using the Angular CLI which is recommended by the Angular team. A project generated via the CLI has many features and tools built-in like testing for example which makes easy to start developing enterprise-grade apps in no time and without dealing with complex configurations and tools like Webpack. This tutorial has a few requirements. Angular CLI depends on Node.js so you need to have Node and NPM — Node 8.9 or higher, together with NPM 5.5.1 — installed on your development machine. The easy way, is to go theirwebsite official and get the appropriate installer for your operating system. For Ubuntu 16.04 users I recommend following this tutorial to successfully install Node.js and NPM on your Ubuntu machine. You should get the version of the installed Node.js 8.9+ platform. The Angular CLI is a powerful command line utility built by the Angular team to make it easy for developers to generate Angular projects without dealing with the complex Webpack configurations or any other tool. It provides a fully-featured tool for working with your project from generating constructs such as components, pipes and services to serving and building production ready bundles etc. Depending on your npm configuration, you may need to add sudo to install global packages. To get a complete usage help. add: Adds support for an external library to your project. build (b): Compiles an Angular app into an output directory named dist/ at the given output path. Must be executed from within a workspace directory. config: Retrieves or sets Angular configuration values. doc (d): Opens the official Angular documentation (angular.io) in a browser, and searches for a given keyword. e2e (e): Builds and serves an Angular app, then runs end-to-end tests using Protractor. generate (g): Generates and/or modifies files based on a schematic. help: Lists available commands and their short descriptions. lint (l): Runs linting tools on Angular app code in a given project folder. new (n): Creates a new workspace and an initial Angular app. run: Runs a custom target defined in your project. serve (s): Builds and serves your app, rebuilding on file changes. test (t): Runs unit tests in a project. 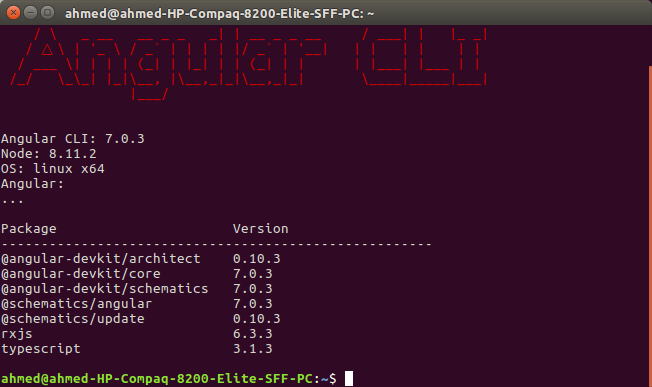 version (v): Outputs Angular CLI version. xi18n: Extracts i18n messages from source code. frontend is the name of the project. You can — obviously— choose any valid name for your project. Since we’ll create a full-stack application I’m using frontend as a name for the front-end application. As mentioned earlier, the CLI v7 will ask you about if Would you like to add Angular routing?, you can answer by y (Yes) or No which is the default option. Ii will also ask you about the stylesheet format, you want to use (such as CSS). Choose your options and hit Enter to continue. You can now navigate to the http://localhost:4200/ address to start playing with your front-end application. The page will automatically live-reload if you change any source file. account-list is the name of the component. You can also use just g instead of generate The Angular CLI will automatically add reference to components, directives and pipes in the app.module.ts. If you want to add your component, directive or pipe to another module — other than the main application module i.e app.module.ts—for example to a feature module, you can simply prefix the name of the component with the module name and a slash — like a path. TypeScript is supported by two big companies in the software world; Microsoft, obviously because it's the creator but also by Google as it was used to develop Angular from v2 up to Angular 7 (the current version). It's also the official language and the recommended language to build Angular 2+ apps. For large projects, you need to use advanced tools like task runners like Gulp and Grunt and code bundlers like the popular Webpack. You can use grunt-typescript and gulp-typescript plugins for integrating TypeScript with Gulp and Grunt which will allow you to pass the compiler options from your task runners. For Webpack, you can use the loader to work with TypeScript. To install them you need to use Typings. It has its own configuration file, which is called typings.json, where you need configure to specify paths for type definitions. Angular, React and Vue are nowadys the most popular frameworks for front-end web development. This is one common thing between them but they have many differences. 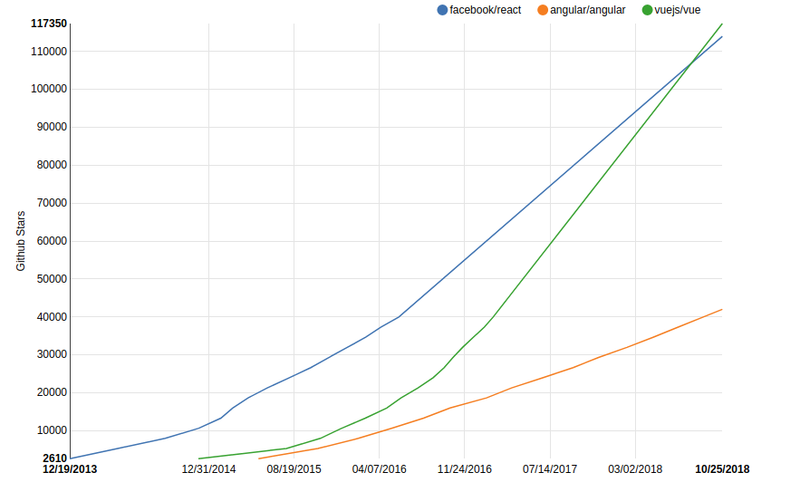 The first difference is that Angular a complete platform for building front-end web apps, while React and Vue.js are only libraries that only deal with the view layer of a front-end web application. Angular has 57 developers on their team while Vue has 25 developers. For React the number of developers in the team are unknown. On Github, Angular has more 40k stars and 755 contributors, React has more than 113k stars and 1,251 contributors, and Vue has more than 117k stars and 215 contributors. Angular is a component based framework with many new concepts that encourages DRY and separation of concerns principles. In this section, we'll briefly explain the most common used concepts in Angular. Components are the basic building of an Angular 7 application. A component controls a part of app's UI. It's encapsulated and reusable. A component's view is built using a unique HTML template associated with the component's class and also a stylesheet file that's used to style the HTML view. We start by importing Component from the Angular Core package and we use it to decorate a TypeScript class. selector: It's used to call the component from an HTML template e.g. <app-component></app-component> just like any other HTML tag. styleUrls: It's an array that specifies one or more stylesheets that can be used to style the component's view. An Angular's component has a life-cycle from it's creation to destruction. There are many events that you can listen to for executing code at these events. Angular services are singleton TypeScript classes that has only one instance throughout the app and its lifetime. They provide methods that maintain data from the start of the application to its end. A service is used to encapsulate the business logic that can be repeated in mu areas of your code. This helps the developers to follow the DRY (Don't Repeat Yourself) software concept. The service can be called by components and even other services in the app. It's injected in the component's constructor via Dependency Injection. Services are used to achieve DRY and separation of concerns into an Angular application. Along with components, they help make the application into re-usable and maintainable pieces of code that can be separated and even used throughout other apps. Let's suppose that your application has many components that need to fetch data from a remote HTTP resource. If you are making and HTTP call to fetch the remote resource from a server in your component. This means that each component is repeating the similar code for getting the same resource. Instead, you can use a service that encapsulates the part of the code that only deals with fetching the remote resources (The server address and the specific resource to fetch can be passed via parameters to a service method). Then we can simply inject the service wherever we want to call the fetching logic. This is what's called Separation of Concerns that states that components are not responsible for doing a specific tasks (in our case fetch data), instead a service can do the task and pass data back to the components. Angular has its own powerful HTTP client that can be used to make calls to remote API servers so you don't need to use external libraries like Axios for example or even the standard Fetch API. In fact, the HttpClient is based on the old XMLHttpRequest interface available in all major browsers. The Angular router is a powerful client-side routing library that allows you to add build SPAs or Single Page Apps. It provides advanced features such as multiple router outlets, auxiliary paths and nested routing. Angular 7 didn't add much features to the router, except for some warnings that notify the user when routing is activated outside the zone. Angular provides developers with powerful APIs to create and work with forms and two approaches that you can choose from when you are dealing with forms: Template-based and model-based or reactive forms. Again Angular 7, didn't add any features to the forms APIs. Angular Material is a modern UI library based on Google's Material Design spec which provides common internationalized and themable UI components that work across the web, mobile and desktop. It's built by the Angular team and integrate well with Angular ecosystem. Angular 7 has added new features to this library including drag and drop support so you don't need to use an external library anymore and also virtual scrolling which allows you to efficiently scroll large set of items without performance issues, particualrly on mobile devices. Thanks to Angular CLI 7, you can get started with Angular v7 by generating a new project quickly with a variety of flags to customize and control the generation process. We have also seen the new features of all Angular versions up until v7 such as ng add, ng update, Angular Schematics, Angular Elements, CLI Prompts, CLI Budgets and the minimal CLI flag etc. 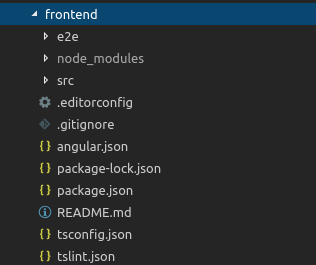 We’ve generated a new Angular 7 project and seen the different CLI commands to serve, build and work with our project.